ePower Network offers a wide range of UPS systems ranging in size from 500VA to 1MW. Our product solutions vary in topology, brand and budget. Today's latest innovations for UPS systems are modular, hot swappable and redundant. These types of UPS systems offer much higher efficiency and reliability with the option to grow the capacity as your needs grow. Selecting the right UPS system can save your operation from downtime and lower your total cost of ownership. 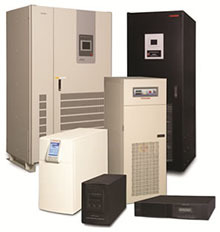 UPS systems take the Utility power in and output power quality to the loads. It provides instantaneous power protection from input power interruptions, supplying energy stored from batteries or a flywheel. There several topologies with Line-Interactive and Double-Conversion being the most widely used in the Data Center space. Line-interactive offers increased energy efficiency, however, less power quality. Double-conversion also known as "Online" offers the purest power quality for critical loads. Most OEMs that are offered by ePower Network come with a standard 3-year warranty directly from the manufacturer. As a "Authorized Service Provider", ePower Network provides post sale services and warranty coverage offered through the OEMs. © 2014 ePower Network. All rights reserved.